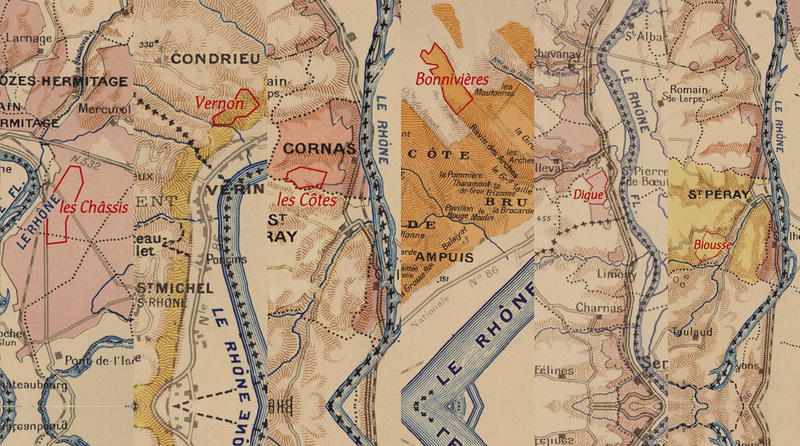 Origin: In the centre of the Côte-Rôtie appellation, in the municipality of Ampuis, stands the locality of “Bonnivières”, a handsome east-facing hillside of mica schist. The “Terres Sombres” cuvée was made chiefly with wines from this locality. Soils: schists typical of the north of this AOC area. Cultivation: high-density planting (8,000-10,000 vines per hectare). No insecticides or pesticides, few treatments (depending on weather), small amount of organic-only fertiliser, with respect of soil and vine balance. Vigour and yield control, leaf-thinning and green harvesting to promote grape maturation. Vinification: the grapes are hand-picked; and then sorted, crushed and partially destemmed in the cellar. Fermented with native yeasts in open, temperature-controlled vats for about 3 weeks, with regular cap-punching and pumping-over. Malolactic-fermented in barriques. Maturing: 18 months in barriques. Style: a complex, profound wine with a nose of dark fruits, spice, tobacco, and a faint roasted edge. Clean and pure on the palate, revealing a rich rounded style. Long, powerful finish. Silky tannins.